As it became known from the foreign edition of Motor1, a new version of the off-road car should debut before the end of 2017. 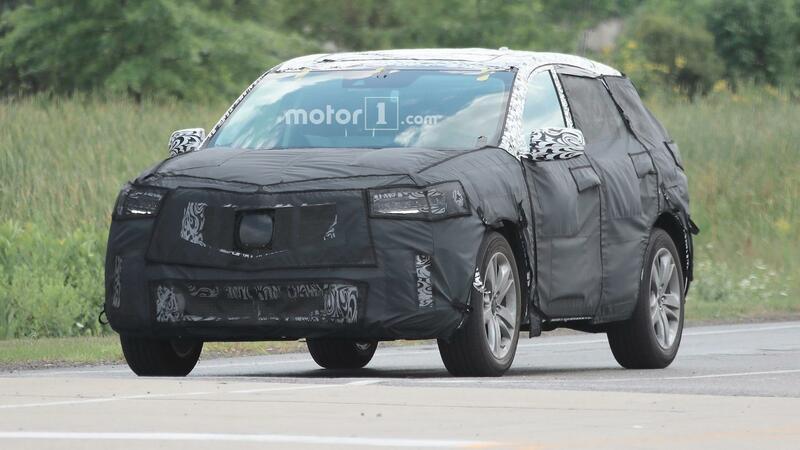 Almost half a year has passed since the day when the latest spy photos of the updated Acura RDX appeared. Back in February, it was clear how SUV will change in the future, as well as some key design elements that help distinguish it from the outgoing model. Now we have the most complete representation of the upcoming SUV. New photos of photo spies already almost fully show the serial versions of the body elements of the updated RDX, with the exception of some elements under a light camouflage cape. So, noticeable new grille in corporate style Diamond Pentagon goes from other models, such as TLX and MDX. In addition, the novelty can get a completely LED head and rear optics, and updated fog lights. In general, the car looks bigger and stronger than the outgoing model, with hints of using the Honda CR-V platform. With regard to performance, it is expected that the RDX will retain the turbocharged engine, but this time the engine will be with a working capacity of 2.0 liters, which will be installed in the base configuration. However, the new engine will almost completely correspond to the power unit with the Honda Accord. In addition, a hybrid SUV version may appear later.